We want you to experience our beautiful country and its great cigar industry and tradition. We are giving away an all expenses trip for two to the 4th Nicaraguan Cigar Festival this next January 14th-17th, 2015 in Estelí, Nicaragua. Enter the giveaway by JOYA RED through your favorite social network! Get a shot at this amazing giveaway by simply sharing a photo of your Joya Red experience on-line using #RediscoverJoya! Post a picture of your Joya Red experience using #RediscoverJoya on our wall (www.facebook.com/JoyaCigars). Make sure it’s a public post! Share a picture of your Joya Red experience using #RediscoverJoya. Remember to tag us @joyacigars. The contest is dated from Oct.17th to Nov. 16th. We will announce the winner on Nov.17th. 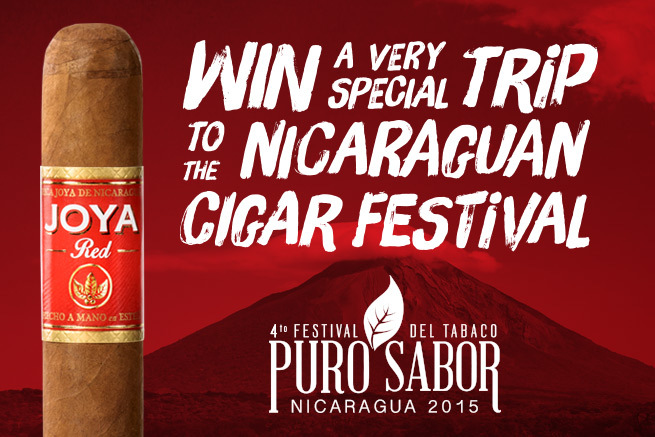 The prize is exclusive for the dates of the Nicaraguan Cigar Festival “Puro Sabor 2015” arriving January 14th and departing January 18th 2015. Prize includes round-trip airfare for two people from the winner’s origin to Managua, Nicaragua, and all the expenses for participating in the Festival: lodging, local transportation and meals. It also includes an intimate dinner with Joya de Nicaragua’s staff. The Nicaraguan Cigar Festival is a yearly event which gathers the most important tobacco producers and cigar manufacturers from Nicaragua and the most passionate cigar lovers from around the world. Visitors will be able to see the most impressive tobacco plantations in the region; the most important cigar factories in Estelí and sample some of the best Cigars in the world, all while the experts, factory owners and brand makers share their passion and knowledge in a very intimate way. By entering this contest, participants accept its terms and conditions. Winners will take part of 4th Nicaraguan Cigar Festival “Puro Sabor 2015”’s program and have to respect its terms and conditions of participation. Lodging, local transportation and meals are covered by the Nicaraguan Cigar Festival and not by Joya de Nicaragua S.A directly. If winner cannot travel on the dates the 4th Nicaraguan Cigar festival will take place, the price will be changed for the 5th Nicaraguan Cigar Festival for early 2016. Joya de Nicaragua, S.A. will not be held accountable in any way if winner cannot make use of its travel prize on the dates specified. Prize is not transferable and is not refundable on currency or any other form of payment. Airfare is in coach in Airline Carrier that sponsor considers more appropriate. Subject to the terms and conditions of the Airline Carrier. Winner is responsible for having a valid passport and visa, if applicable. All other travel arrangements not specified in these terms and conditions are responsability of the winner. Winner will receive all information, including e-ticket and festival inscription via e-mail. No physical mail will be sent. No purchase necessary. 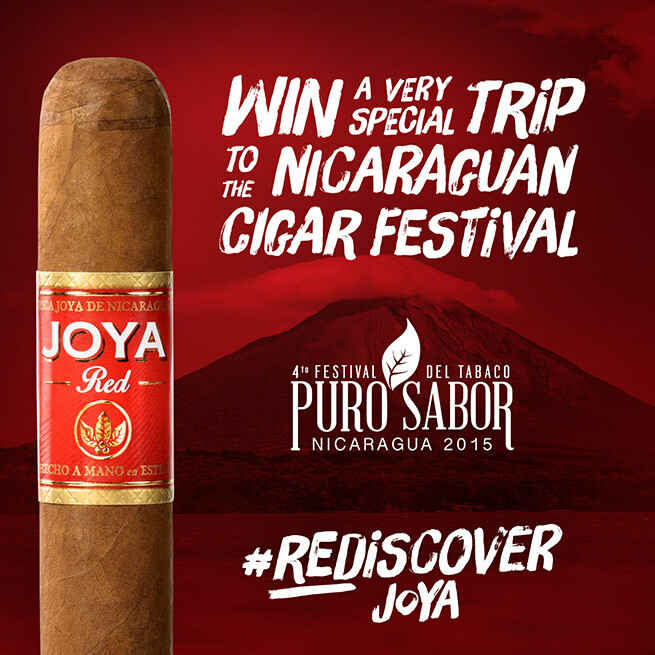 You can also participate by uploading a video stating why you want to try our Joya Red cigar using #RediscoverJoya and tagging us. Winner will be notified through the social media channel of participation 72 hours after promotion ending date. Must be 21 or older to participate. Winner and companion will be asked for proof of age. Contest is opened to residents of USA, Canada, Nicaragua, Mexico, Spain, Germany, Switzerland and countries/states/cities where law permits it. All traveling taxes, fees, and surcharges are the sole responsibility of the prize winner. These are some of the participating photos, automatically indexed here by the #RediscoverJoya hashtag.